What Do I Need For My HOA - Universal Landscape, Inc. Many surveys over the years have listed that having a home project done can be near the top of the list of stressful experiences for people, of course depending on what nature of work you’re having done and who you might be dealing with. After decades of serving homeowner’s, we are fully aware of the stresses a project can place upon different people and this article here is intended to help with one possible aspect of the process, of those dealing with HOA’s. (HOA = Home Owner’s Association) Some HOA’s are great and simple, some are not. Another aspect is the contractor you choose to work with, and our mindset from the first time we make contact is to be amongst the best of any you might ever have work for you. Our work can vary from smaller landscape projects to the truly transformational through our partnership with Telese Builders, LLC for a backyard makeover that can include, but not limited to new swimming pools, outdoor kitchens, tiki huts or pergolas, home construction extensions. Depending on where you may live, an HOA can be a required part of the process. Part of this process is to anticipate your project questions, your personal needs ahead of time, as this article is an example of exactly that here. Many common & other questions answered here arise from decades of experience that not only helps us to troubleshoot potential obstacles, challenges and questions but also in providing you a reference here for diffferent aspects of HOA relationships and requirements. If we are working for you, we hope you’ll find this article of common HOA needs and questions by residents helpful in making some confusing situations a lot more simple and easier to understand. Let’s just start by saying that “All HOA’s are not the same” and we mean that in a good and sometimes more difficult way. No matter which one you might be living in, we are long experienced in providing the information for your project in a manner that HOA’s like to receive and are ready to provide all of the information they may request from us. Let’s start out with some common questions our customer’s have had over the years regarding their HOA and the process of having a new or renovation landscape project designed & installed. Also, we can address your questions regarding their requirements for new Swimming Pools, kitchens, pergolas, patio or driveway extensions, etc. which we can discuss briefly here and can address in more depth in those particular project pages of our site. What is required typically by your HOA for a Landscape / other contracting project ? What should you make your HOA aware of regarding your irrigation if you live in a neighborhood that has a ‘Community Irrigation System” regarding new landscapes, pools or decks, driveways, home additions? Follow up regarding your landscape irrigation by your HOA after a landscape project has been installed. Of all the questions we deal with this one is the most frequent and most undetermined. There is no straight answer across the board that will be the same for all and we do not wish to provide the wrong advice. Always best to check with your neighbors and your own HOA first. Some communities can be very lax and easy going or even largely non-existent. On the other side of the coin, you have those that are hyper-sensitive and can even be very invasive in the process with their own rigid guidelines. Again, always best to check with your neighbors and your own HOA first, if you are unsure. Small project cleanup and planting verses a major renovation. The rule of thumb is, the larger the exterior project, the more you should check. The standard HOA which is made up of neighbors living in the community. These people are elected, usually once a year by the residents of that neighborhood to oversee that certain standards or processes are followed by the neighborhood’s own guidelines. Some of the HOA’s will have people working full or part time in a community clubhouse typically, to handle all matters of ongoing maintenance, new projects requests as well as issues for the upkeep and improvement the neighborhood needs. Some HOA’s that are smaller or more laid back will have only a few individual’s in charge of review and the approval or denial is based on that individual’s interpretation or personal decisions if a project should pass or not. Developer’s in Charge of HOA : These boards that make approvals will usually be conducted by a group or company hired by the Neighborhood developer while the neighborhood is first being built and at times for a couple of years after the entire neighborhood (or a majority of it) is finished with completion. Professional Property Management Company : These boards are typically the quickest to make reviews along with approvals and denials. Usually hired in larger communities by the residents to perform many of the required tasks related to managing the neighborhood. There is not usually a waiting period for a certain date as they are used to handling reviews and project requests on a regular basis and are typically efficient with it. These people, especially an experienced property manager for a neighborhood can set the tone and be a great asset for both homeowners and contractors to work with and help to facilitate projects. This is a point that should be found out which can help to let us, or any company know by what date you may need to have all relevant information gathered and submitted. After finding out if your project qualifies for a need to be submitted, most large renovations for many communities will require submittal, this is the 2nd piece of information you should gain next and make note of; the timing of your HOA meetings or when projects are reviewed. Some of the HOA’s will have monthly meetings for reviewing projects which are open attendance for the residents, when projects that have been submitted can be discussed openly for approval or rejection. Some neighborhoods, larger or more established ones especially, allow projects to be submitted for review at anytime, on a regular basis. They are usually neighborhoods with many residents and are long experienced in handling resident project requests. This answer depends upon the type of HOA you live in. Those that have an open policy that projects can be submitted at anytime, those are usually the quickest to respond. Some neighborhoods can get an answer back the same day or in a few days typically. Monthly submittal meeting HOA’s , these are usually the slowest. Your project is only available to be reviewed once per month. Some are easier to deal with than others. If you miss the submittal date for the month, you may have to wait another entire month to submit your project for review. Once reviewed, some of these HOA’s will have your answer possibly at the end of that meeting or within a couple of weeks. Again, it depends on the HOA. What information do I need to know about what an HOA requires ? Typically an HOA, developer or property management company will have a set of guidelines available in a printed copy for you pertaining to the project you have in mind. 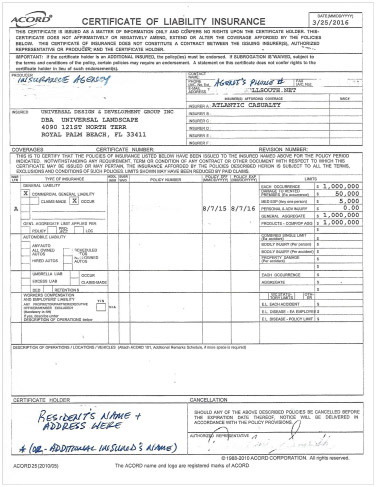 Often, this is included with the closing sale papers for the residence when it was purchased. If you are in need of a copy or to find out what the standards or guidelines of projects are, they will usually be quickly supplied to you if a review process is required. What will the ‘Review Board’ expect of me when I submit the project ? 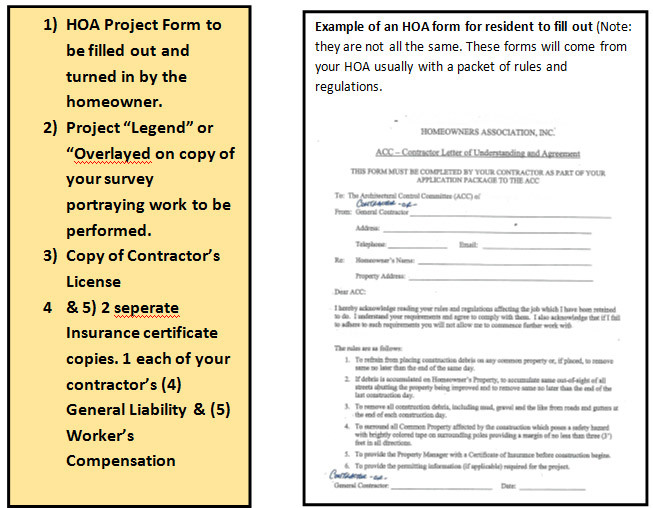 Filling out a Form for your project from your HOA : There will usually be some paperwork they will provide for you to fill out requiring your name, address, contractor name & description of the project. Possibility depending on your HOA, Security Deposits for some HOA’s & some projects : For some larger projects, notably pools, additions, etc. some may require security deposits which are there in reserve to make sure the property, or a neighbor’s property is restored if left damaged by a contractor – or to help finish a project – again if a project is left unfinished by a contractor. The intention of the Deposits made by some communities is to serve as a safe guard for the homeowner, while the percentage can vary. This is not done by all but by some communities. 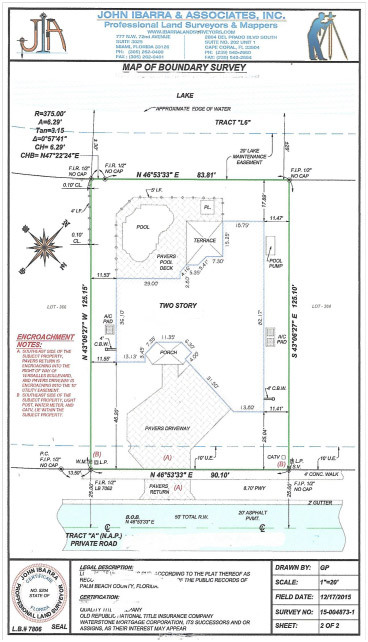 Project Overlayed on a copy of your property survey (item usually required) An Outline of the project on the survey showing the changes, improvements to the property. With landscaping, we provide this as a simple sketch on an often enlarged copy of your survey. With new pool’s, decks, etc. this may be a permit ready copy, by an engineer of the project to be performed. Note : This property survey is usually combined in a packet with the closing papers for the house. The example of a typical survey here includes certain information that is needed. As in the example, it will show an overall view of the property dimensions, set backs, easements as well as the shape and dimensions of the home, driveway, pool, patio, etc. “I’ve lost my survey, where can I get another one?” There may be a chance your HOA has a copy, if not, for a few dollars or less, with a visit to your local city hall, or county building department if your property falls in an un-incorporated area, you should be able to acquire a copy there. Word of advice : 1) Keep several hard copies, 2) Retain those with official seals only to be submitted for permits. 3) Keep a copy in a jpeg file so it is easy to be emailed to any contractor or designer you might choose to work with pertaining your home if the need arises. Through our partnership with General Contractor, Telese Builders, LLC we can supply any and all required documents for the General Contracting of whatever aspects or portions for your ‘backyard makeover’. Landscape, pool or other project submittals, re-cap, “what do I need ? :” Typically 5 pieces of information. Here is an example of an insurance certificate. The copies of these for worker’s comp insurance and for general liability are provided by the carrier’s of the insurance for a company or an individual. The information that it contains are : Policy # and limits. The name and address of the insured contractor. The name and address of the insured customer. Contact information for the insurance agent and / or insurance carrier should need arise. Insurance companies charge extra for this and we can provide this through our carriers and an additional charge will accompany this as part of the cost of a project. Please note : This is usually not required for smaller installations or projects. There is a standard minimum fee of $125 payable to us, if this request of our insurance companies is required. The proper amount of trees or palms for a property. Amount of ‘green space’ on a property for some neighborhoods, especially some older, ‘historic’ neighborhoods. Types of trees, plant material to be installed. This has to do with the quantity of trees or palms on a property more than anything else. Some HOA’s will be more stringent on the requirement of a number of hardwood trees or the number of palm trees on a property more than others. If so, if you happen to live in one of these neighborhoods, your HOA will make you aware of any requirements at the time the project is submitted. Palms verses Hardwood trees : In cases where there is a requirement for the property’s in your neighborhood, (most HOA developments in general have this) there will be a total number of trees to be maintained. VARIETIES OF TREES TO CHOOSE FROM : The HOA should have readily available a list of approved trees if they are reviewing the species of tree(s) for approval. Over time, some species of trees (hardwoods or other) may be added to an “Invasive Species” List. Now the great majority of companies would never install one, and frankly, nursery growers wouldn’t grow them, however, this is an official note to not plant any of these in any case. Another aspect of the tree requirement’s for a residences landscape has to do with the environmental and ecological overall ‘footprint’ of a community. At the time of original development, or adjustments to a ‘renovated’ community, there is a number of trees and plants that are to be planted overall in a community to meet a certain mark of plantings for balance environmentally, besides aesthetic requirements some communities might have. These overall community numbers are then broken down by the square footage of property for each individual residence and a number is set by the local planning and zoning authority and must be satisfied before a newly constructed home can receive its certificate for occupancy. This should not hinder your newly desired landscape design, as we state with all of our clients that we must work within the guidelines, but when it comes to design, the first thing is to create the look that is desired, then, go back once again and check the different regulations to make sure it is in line for review before it is submitted. A Simple question on the subject to your HOA should be your first, best place to ask. If the person you’re talking to doesn’t know, ask them to give you the name of who to talk to and then our suggestion is to speak to them. Sometimes, we may readily have some helpful info. based on where you live and what you’re looking to do, that we can bring forward in our on site free consultation for new project designs. If removing trees, many times, depending on where you live, what kind and what size of tree is to be removed, at most a permit must be filed locally to have that tree removed. If you need help with this, we have licensed and insured tree arborists who we can refer who perform this work. This gets into what varieties are going to be replaced, if necessary, after the trees have been removed. It is best to submit your plan, with the replacements already in the design for your HOA review. If you need a city permit for tree removals, your HOA should make you aware at that time of project submittal, or in simple questions on the subject beforehand (even better). Your city or county inspectors may provide you a list of acceptable size and variety of trees for you and your designer to choose from. The HOA may handle this entire review and approval in your circumstance, or in some cases, your HOA may hand this process over to the local City Inspectors for the entire process if a permit and city approval is required in your case. To have the tree(s) removal permitted, you will again need to have their city form filled out for the permit tree removal request, and in many cases, showing the license and insurance information for the company performing the work. A certified arborist is the one to choose. One common exception is if they are part of a common street scape for the front swales of properties throughout a neighborhood. Usually these have to remain the same species of tree for consistency. For other areas of a property, the great majority of the time, the answer is yes. If going for hardwood trees that go with the look of your desired design, there may be a list made readily available to you by your HOA of acceptable hardwood trees. Your HOA might not have any list, and they will review the choices made in the design we collectively have chosen for your project during submittal. If you may wish to have palm trees instead of hardwoods, there is usually a number or simple formula as follows that different neighborhoods and cities will use. Some areas will have a variety of palm species as 1 palm tree counts the same as 1 hardwood tree. Some areas will have a requirement where 2 palm trees, or even 3 palm trees equal only 1 hardwood tree. Then again, there also may be height requirements on those replacements imposed by either the HOA or the city municipality. Not all go through this, as all properties and all neighborhoods and cities are not the same, but enough may have the need to look here and when it comes up, it’s a part of the process that we can help foresee and offer this helpful info in advance. This has to do with older homes primarily that are renovating most often, not only the yard, but often times a driveway, patio or including additions to an existing home. Some neighborhoods that are much older and designated as an official ‘historic’ district or neighborhood might find the most concern with preserving the amount of space a home takes up on a property when considering renovations, or enlarging a driveway or patio. There is usually little resistance to any garden or new landscape, but the hardscape considerations are what may come up under the most careful review. This is usually based on a set percentage the township may have in place, to measure the amount of front yard to be ‘green space’ (lawn or landscape area) in comparison to the overall ratio of square footage of the property. This would be reviewed for approval before a permit for a driveway or home addition is approved by the proper, ruling municipalities planning and zoning division. This relates to all having new pools or new enlarged decking, driveway areas installed. Also, for larger renovation landscape projects. If you have an independent irrigation system, with the timer and controls for your irrigation located at your own home, this is simple to check out. Simply test all the zones and see if there are any breaks or areas not properly working before work begins. For projects we perform, we do this before we begin any project. Note : For those who live in HOA’s where the irrigation system is combined on a “Community system for irrigation” which each resident does not control, the following points are helpful to note. Contact your HOA prior to the project to have them test your irrigation. They will typically have a maintenance person or company that is in charge of dealing with the irrigation for your landscape. Good to know about prior condition of system, broken lines, heads, etc that this type of HOA should repair for you as part of your HOA maintenance fees. If having a New pool, deck or addition installed, ALWAYS, HAVE YOUR IRRIGATION SYSTEM LINES CAPPED OFF FIRST PRIOR TO CONSTRUCTION of that area. The reason, if lines are not capped off they can comprise the pool or deck during construction or after from irrigation regularly running underneath or near those areas. Include Photos here of damage to new pool. If your HOA doesn’t have anyone to provide this capping off service for the irrigation before a project is performed that requires it, if we are working for you, we can have irrigation contractors we work with take care of this for you. Typically they charge $150 to cap off irrigation lines. NOTE : For new pools and decks, etc. the irrigation will need to be re-connected after the project is completed. Many pool builders, decking, driveway companies to not allow for this expense in their proposals. If your HOA has a company that is supposed to be exclusive for the community and the only company allowed to work on your irrigation, let them know in advance that you will need a price from your HOA’s irrigation contractor to re-connect the irrigation after your new pool or deck, driveway is complete. The problem with this situation, many times, more often than not, we find these HOA companies not to be the most responsive, so it is good to be ahead of the curve on this one and present this need at the time your project submittal is first presented, or even as soon as you know you want to have the work done, even before formally submitting the project. In some cases, these companies we and sadly our customer’s have found to be completely unresponsive. In those cases, we can provide contractor’s who can perform this work for you, that work with us on a regular basis. From the capping off of the irrigation to the re-installation. If you are in a development and you are independently responsible for your own irrigation, we can help provide you with contractors to perform this work before and after your project for you in a timely, professional manner by contractor’s we work with that are fully licensed and insured. There is no set pricing for this work as many properties are different in size. When it comes to the landscape installation after these projects are done, the landscape is the last piece of the puzzle to be put in place, and importantly, to have proper working irrigation is the best insurance to help sustain the health of your new landscape. The prices can vary even amongst the smallest xero lot line homes from anywhere from $1,100 to $1,400. If the areas being disturbed on a larger or even smaller property include different portions of the property at the same time, or there are circumstances such as large existing roots or obstacles in a property to work around, these price averages can definitely go up. Best to get a price beforehand of what it will cost to eliminate any surprises that can challenge your budget later on. Regular residential lots can also be in that price range from $1,100 to $1,700 as well. Again, there is no standard pricing. It is at this time that some properties where the irrigation hasn’t been working for a while or it may have issues, that this is the most cost effective time to have the repair work done, if needed. While working on an existing project, it is most always more cost effective to get more done at the same time, with most any trade. After your project is completed, make sure your HOA is on the ball to make sure your landscape is watered properly after. Our warranties depend on proper working irrigation & watering for our landscapes, especially after installation. To note : the time immediately following the installation of your landscape is the most important time to have proper watering. We typically suggest watering for 45 minutes to 1 hour per day per zone, everyday from the time of the landscape installation through the first 2 to 3 weeks. For the great majority of properties this will be standard and a safe common standard no matter the time of year. Some properties may require more water, or some less, by a bit, depending on soil conditions and the weather being experienced at the time. A lot of rain, verses very little. If your property requires something different, we will most often make a special note of this in person or in writing with you, our customer. For new lawns, we suggest watering for 2 to 3 hours in that area for the first day to few days to help give it a good start. Some species of Larger mature trees can require double this amount or more in the first days following a new installation and we would make the customer aware of this need. The type of tree, the soil conditions and the weather at that time can have an influence if more water is required. If there is a good rain shower, or a storm, that’s better for the lawn and landscape than the irrigation and you should not need to water. A heavy 30 minute rain is great for new landscape installations. When watering, best results are early morning or early evening, before the heat of the day has occurred. Proper watering for those first 2 to 3 weeks is critical for the health of your new landscape. Your HOA should recognize this and accommodate you, and it is important that this is done. Improper watering can void the warranties on landscape installations if not properly performed. After those first 2 weeks, the next phase to get through is the first 3 months from the time of installation. We suggest watering every Other day through this period for the duration of the first 3 months after a new landscape is installed. If your HOA refuses, you can set up garden hoses and or soaker hoses with timers that can operate off a home’s hose bib attachment to make sure. We can provide this hookup for you if you are in need and unsure. Even in times of drought or watering restrictions, which are determined in our area by the south florida water management district, they show the need and allow for this very important time in the first 90 days after installation for more water than any other time, no matter what degree of restriction for residents. These Hose bib controllers for hoses or soaker hoses run off of 9 volt batteries most often and can be purchased for between $35 to $45 at most Lowe’s or Home Depot’s. 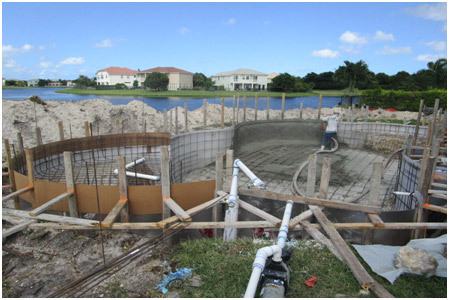 So, to recap, make sure your HOA knows and that they follow up that after your project is complete, if you live with an irrigation system that is run by the community and not controlled by you, to be prepared to have the water come on daily starting the day your new landscape is installed. Note : Sometimes the landscapes are installed before, sometimes after the irrigation, one thing we make sure of, whichever the case may be, that everything is watered by hand regardless of the irrigation, the day everything is installed. If special circumstances are required for larger projects, we will either hand water daily or set up a temporary soaker hose set up for you. We have a vested interest through our warranty that your new installation stays healthy, so your irrigation is just as important to us as it is for you. We hope that you may have found the tips and answers to common questions regarding many common questions with some projects and HOA’s helpful. If you are looking to have a project done and are in our service area, we hope this aid to help avoid potential problems and adding foresight to the process of different projects is found helpful, and you will think of us for your next project. A main driving effort we have as a company is to be amongst the best you would ever hire to work for you, and while this customer service approach drives us each day, hopefully the care to help navigate this process of HOA’s can be seen of the care we take with each customer we have the privilege to serve. Wishing you the best with your project, and again, if you have a project we perform and you’re in our service area, we hope you’ll consider using us, Universal Landscape, Inc. & Telese Builders, LLC !